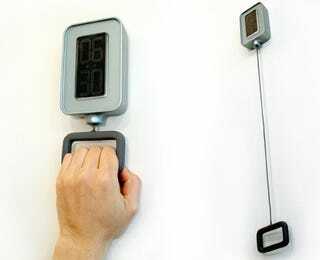 This clock was designed by Duck Young Kong and has a very simple and functional design. To set the alarm you simply pull down the handle to the designated time remaining. The alarm will sound once the handle reaches the top and a simple tap on the LCD screen will shut it off. Take note, this is just a conceptual design, so don't expect to see it on the shelves at Wal-Mart anytime soon. It is still pretty neat, nevertheless, but I'm sure having to precisely set the alarm depending on your bed time would get old, quick.